OK guys, This will be the last post for the year leading into a bust week over Christmas and the New Year. I hope you all have plans to be outdoors with family and friends while consuming some of the finer things in life such as wine, cheese and smoked trout. The weather looks like it may be a bit overcast or even rain but it will be what it will be and chances are it will be just fine. The lake has been fishing really well first thing in the morning and late afternoon with lots of good condition fish surfacing and hitting the Harling fisherman. The deep trollers are doing well most of the day while targeting those reefs and the jiggers ……..well they should just be banned but they are doing very well also. Matt from Rod and Tackle is the man to speak with about the lake as he has been out most days and caught a bin of fish while Harling the fly rod in 20 feet of water. If you have a boat thereÂ is no need to rush to the other side of the lake the best fishing has been right on the lake front. 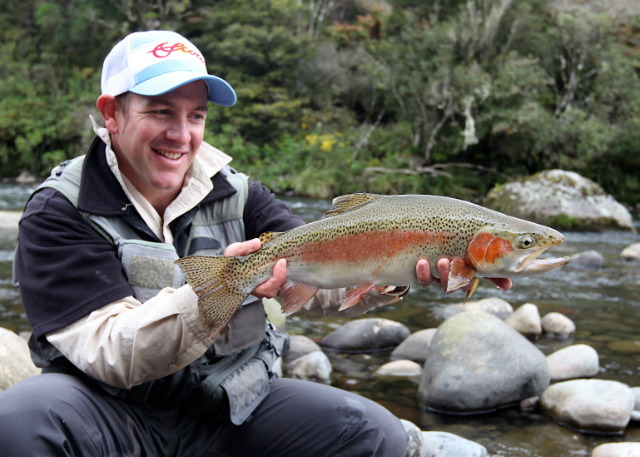 I have just arrivedÂ back from town and noticed dozens of boats in skiÂ lanes and motoring about like kiwi’s do so try and stay clear of these guys and find a patch of quiet water and the fish wont be spooked and will rise again in the evening. The last few weeks we really haven’t really had much rain to speak of so I’d bet that most rivers will be in perfect condition for summer fishing with light gear. I have heard some Cicada’s in taupo so I bet they are starting to appear in the native bush just as quick and will soon be on trouts diet. 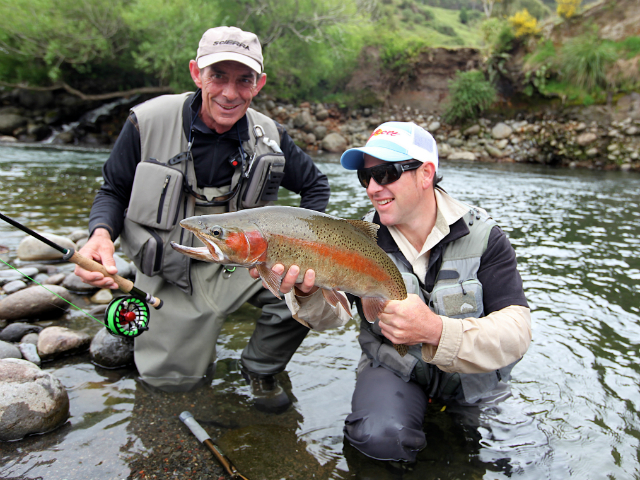 Trout will take a few weeks to zero in on this substantial food source but once they do there wont be much point using anything else, kiwi anglers are spoilt once these guys starting hitting the water. I have some exciting backcountry stuff booked early in the new year with heli and quad bikes so lets hope for more low water and warm conditions so I can show our tourists what we are really about. The local fishing seems to be pretty solid with quite good numbers of older fish hanging in the Hine. 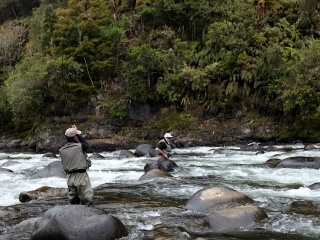 This river will have plenty of dry fly already and the evenings should be alive with small trout munching on Caddis hatches,Â Cicadas will play a big part of insect life in here also they just love the Kanuka and Manuka bush.Â Anglers are still catching plenty of fish in the Tongariro and some anglers are now starting to see the odd brown. The browns seen and caught have not been the traditional monsters but are still about 4 or 5 lb and are found somewhere about the Blue Pool area. The upper river fish are moving down and that usually means there are more fish for anglers to catch through the lower reaches while they are recovering, these fish will be hungry and not overly hard to get a take from. 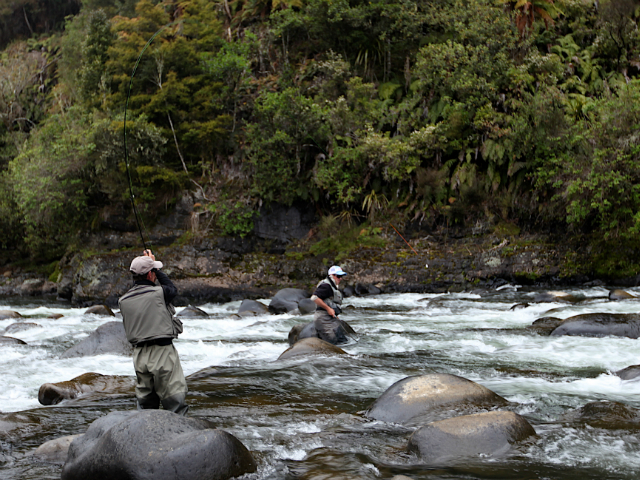 The Waitahanui has had the odd brown sneak through and the next few weeks will see some of Taupos biggest trout move into here or start to hang about the mouth. Boats will start to catch these fish while harling in the morning and the night fisherman will certainly pick up some goodies on fur flys and sinking lines. Sunsets are amazing at the moment and standing in the rip can be pretty special and relaxing, could be worse things to be doing eh. Promise me to have a safe and merry Christmas, look after your loved ones and share those special fishy moments with the kids. Thanks for another great year and with your support we will still be here for a while yet.